Oregon State University President Ed Ray and David Hurwitz, associate professor of transportation engineering at the 2018 University Day awards dinner. Oregon State University kicked off the new academic year with University Day, an event which reunites campus colleagues, provides informative and fun activities, and recognizes faculty and staff for their exemplary efforts and achievements. 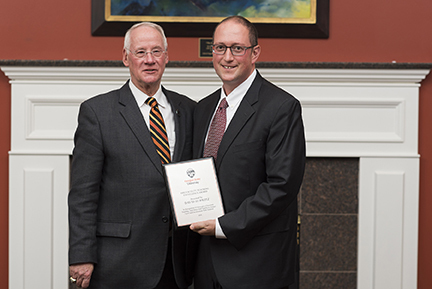 David Hurwitz, associate professor of transportation engineering received the OSU Faculty Teaching Excellence Award, which honors unusually significant and meritorious achievement in teaching and scholarship that enhances effective instruction. Hurwitz received the award in recognition of his use of current research in engineering education to improve classroom instruction, his unique and innovative technical courses, and his use of state-of-the-art research equipment – including the Driving and Bicycling Simulator – in the classroom. Students use the driving simulator to study driver responses to a wide range of situations and conditions. Since the simulator is one of only a small few of its kind in the U.S., Hurwitz’ students have unique abilities to connect road and signal design and traffic conditions to traffic safety and efficiency. Earlier in 2018, Hurwitz received the Sponsored Student Organization Advisor of the Year award for his work advising the OSU ITE Student Chapter. The award recognizes faculty and staff who take extra time to ensure their respective club/organization has success and develops a team atmosphere. Congratulations, David Hurwitz and thank you for your dedication and many contributions to student success at Oregon State.